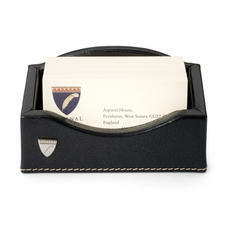 Handmade by our Master leather craftsmen, each beautiful business card holder is meticulously crafted in a solid cedar wood frame and then hand bound in the most beautiful Mock Croc Calf or English Bridle Leather. Each card holder is hand stitched in contrast stitching and the interior is lined in Aspinal signature contrast super soft premium suede, with a slightly padded compartment for that extra luxurious touch. 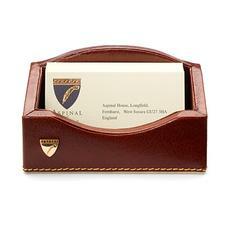 This is an elegant piece of traditional craftsmanship that will look stunning on any desk. Matching desk accessories are available.